· Make an estimation of the maximum steady state load. · Make an estimation of the transient load. Include peak, inrush, switching spikes and loads that are only turned on intermittently. Select a CB that has a high enough rating to prevent it from tripping during normal operation. A general rule of thumb is that the CB should be sized so that the continuous load is no greater than 80% of the CB ampere rating and 100% of the transient load. It is acceptable to have a CB sized too large for a load. A circuit breaker may also require additional derating due to elevated temperature or high altitude. The wire should be sized so that the CB will always trip before the wire is damaged due to on over current condition. Typically an industry standard table is used to look up an acceptable value, i.e. 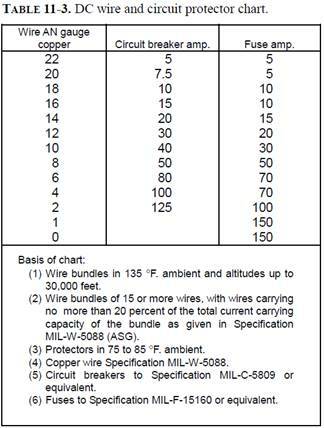 TABLE 11-3 from AC.13-1B for aircraft or refer to NEC for home wiring. Additionally, the wire and connector contacts should be selected so that they are properly derated. A general rule of thumb in the aerospace industry is 100% derating for connector contacts and wire. You can always use a larger wire, but never smaller. Refer to AS50881 for specific details on wire derating. Another important consideration is the interrupt current.